Marvel unveiled a couple new digital innovations last night, and at least one is going to be worth getting just to see. If you go by the press release, Infinite Comics is going to be the hot new thing for digital comics. But if all you read was the press release then you wouldn't know what it was; Marvel was delightfully vague on the important details. Luckily for us Gizmodo got an early look and their description rang a bell. Do you recall a couple weeks back when I posted about Mark Waid's digital comics concept? It turns out that the demo video in that post showed off some of the features of the new Infinite Comics that Marvel announced last night. In fact, Mark Waid led the team that developed it for Marvel. The video he posted looks to be an unannounced teaser for today's news. As you can see below, time has been introduced as a story telling element. A page of comics isn't shown all at once; the artist can set the comic to show word balloons, frames, and focus points and allow the reader to advance through the comic one point at a time. The artist has other tricks in their toolkit, including inserting a flashback on top of a scene, changing the depth of field of a panel, slow zoom, etc. This is rather different from current digital comics, where an entire page is displayed at once. ComiXology's directed viewing might help you go from frame to frame and zoom in on key points, but it's really just a cobbled together add-on to the original paper comic. I wasn't too thrilled with it when I first saw the video, and I'd still like to see someone abandon the frame concept shared by all comics. But I am going to go buy the first comic to use this tech when it's available next month. 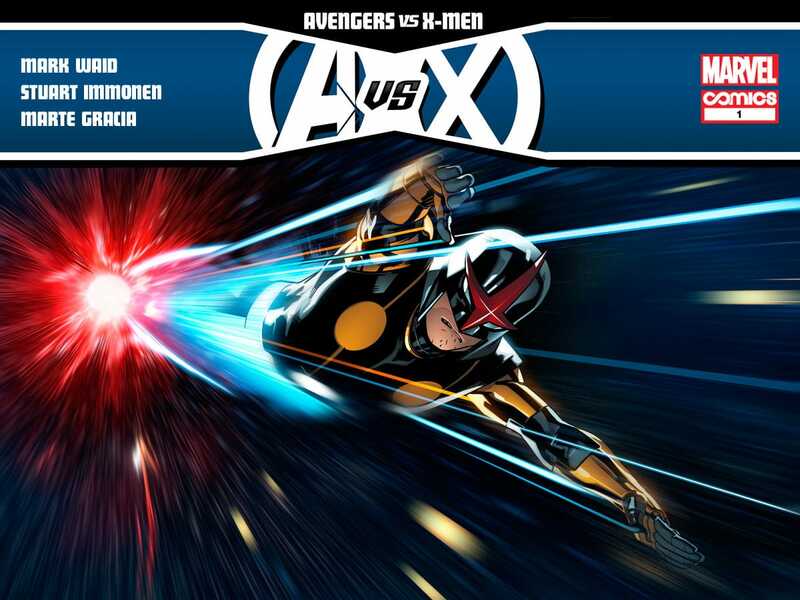 You'll see it first in Avengers vs. X-Men #1, which is due out on 4 April. Marvel will sell the comic in their app for $.99, and you can get it for free with the purchase of the paper edition of the comic.